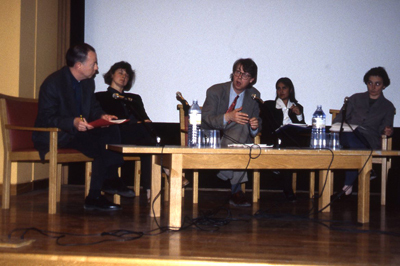 This conference follows the highly successful symposium Writing Art organised by Rear Window and the Kent Institute of Art & Design in April 1994. This event explored and highlighted some of the many conundrums posited by the notion “writing art” once the assumption presumed by the preposition “about” or “on” are abandoned. Translation emerged as a key theme which this, the second conference, will consider. 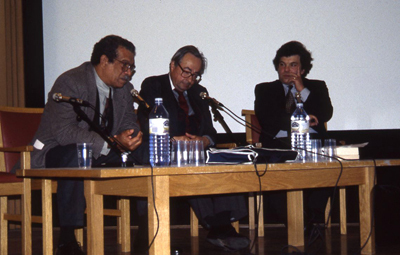 This conference proposes translation as a metaphor for writing about art. It considers the act of writing art as the act of creating art through interpretation. Its aim is to poses a series of questions which in summary might be phrased: How to re-write visual art—language as translation? Derek Walcott was born in 1930 in St. Lucia, Windward Islands, in the West Indies. He divides his time between Trinidad and Boston, where is Professor of English as Boston University. Amongst his many plays are Dream on Monkey Mountain, Pantomine and The Last Carnival. Omeros, a long narrative poem was published in 1990 and won the W.H.Smith Literary Award. In 1988, Derek Walcott received the Queen’s Gold Medal for Poetry and in 1992, he was awarded the Nobel Prize for Literature. George Steiner is Extraordinary Fellow of Churchill College, Cambridge and Professor of English and Comparative Literature at the University of Geneva. He is the editor of Poem into Poem: World Poetry in Modern Verse Translation, and the author of Real Presences. His book After Babel is a major contribution to the issues explores in this conference. Andrew Benjamin is Professor in Philosophy at University of Warwick. He is the editor of Poststructuralist Classics, and Problems of Modernity: Adorno and Benjamin, and co-author of What is Deconstruction? He is the editor of the Journal of Philosophy and the Visual Arts and the author of Translation and the Nature of Philosophy and Art, Mimesis and the Avant Garde. Claire Pajaczkowska is Senior Lecturer at the school of History and Theory of Visual culture at Middlesex University. She has translated Freud and Reich Psychoanalysis and Illusion by Janine Chasseguet-Smirgel and Bela Grunberger, Wilfred Bion, His Life and Works by Gerard Bleanndonu, L’Image by Jacques Aumont and Le Discours Vivant by André Green. Joan Key is an artist, writer, curator and part-time Lecturer at Goldsmiths College and at the School of Fine Art at KIAD, Canterbury. She has contributed writings to books and journals, her most recent essay appearing in New Feminist Art Criticism (ed. Katy Deepwell). Her recent exhibition include Painters Who Make Prints and Surface Tension at the Curwen Gallery, and Abschied/Arrival at the Bahnhof Westend in Berlin. Sutapa Biswas is an artist and lecturer. She was a Fellow in 1990 and 1992 at the Banff Centre of Arts, Canada. She was nominated for the European Photography Award in 1992. member of the Arts Council of England’s Art Project Committee and member of the Board of Directors of the Institute of International Visual Arts. René Gimpel is Director of Gimpel Fils Gallery, London. Bracha Lichtenberg Ettinger is an artist and practising psychoanalyst who has been living in Paris since 1981. Her work, Matrix-Borderlines was exhibited at the Museum of Modern Art, Oxford, 1993. Giuseppe Mastruzzo is a Sicilian writer who has been living in London since 1992. He is currently enrolled as a MA Student on the MA Art Criticism and Theory at KIAD in Canterbury. The novella, Camera Realm, published to coincide with this conference, is his first publication.